For round three of the Super Online Sewing Match we were given U-Handbag’s It’s a Cinch bag pattern. When picking fabric I was quite conflicted. I think for the prior challenges one way in which I have fallen behind a bit is by being much more simple than the other contestants. I really like things to be clean and modern, but sometimes that can feel less detailed and less ambitious. But in the end I decided to stay true to myself. For me, simple and often solid colored items feel more expensive and more importantly more like something I want to use/wear. The outside is a textured black and white home dec weight fabric that I found in the garment district. The accents are all leather which I salvadged from an old leather jacket that my husband found in the trash a few months ago. The lining is a simple kelly green thick linen for a pop of color. This really is a great pattern and is very customizable. I made a few changes to make it more suitable for my tastes. First of all I moved the straps out by about an inch. For some reason I just prefered that spacing. I also added a large piece of leather as a sort of fake front to the pocket (the outside pocket is actually in the lining). On the other side of the bag I also added a square pocket with vertical stripes to add some visual interest. One feature that I love about this pattern is the ability to cinch up the sides with the hook and d ring. The shape of the bag goes from a boxy tote/laptop bag to more of a handbag by simply hooking the side together. I used brass for all of the metal pieces of the bag including the zipper. The pattern has a great way of attaching the zipper which makes it much easier to assemble than I would have guessed. I also added little zipper pulls with some scrap leather. Like I mentioned, the lining and is a great linen that is a bright kelly green. There is a nice elastic pocket on the side too to keep my cell phone etc… in. In the end I am SUPER excited about how this bag turned out. Can’t wait to use it right away. Love the bag! Actually, the whole outfit really! Simple and stripes is just my style! Wow! It is fantastic. 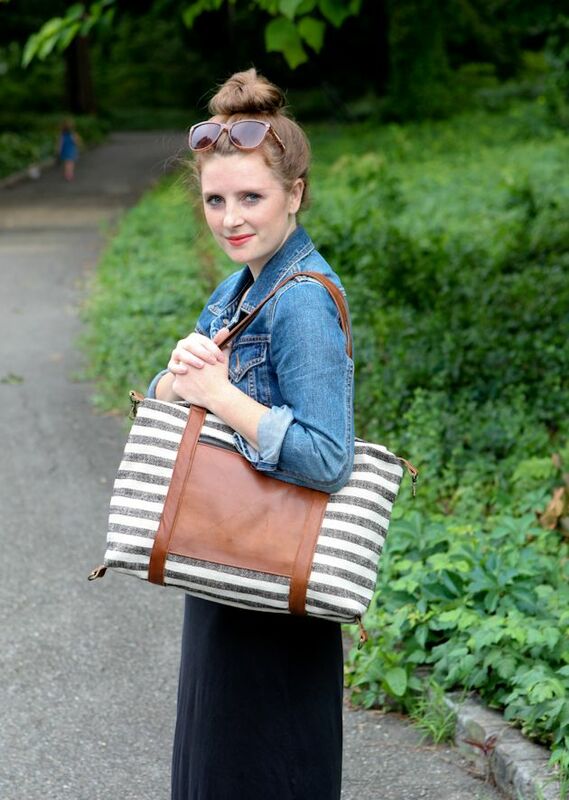 I think you did the right thing using those fabrics & features – it is a great bag. Wow, wow, wow! Kelli…this is awesome! I looked at the pattern when round three was announced and I just wasn’t sure if it was my style….your bag, though, makes it look amazing! great bag! all the hardware and leather detailing makes it look super professional. I love the strips with the leather detailing. Really great job! Stripes! Sorry its been a long day. Simplicity is good. Loving the bag and I would actually like a repeat of yours. I’ll keep rooting for you! Whoa cannot believe you made this!! Unbelievably amazing. All those little leather features really make it! Kelli this is AMAZING, oh my gosh. I would buy that in a freaking heartbeat, my gosh I kind of can’t get over how much I love it right now. haha, if you don’t win this round then I don’t even know what to think anymore. I actually don’t even know if you can win rounds but you definitely deserve to win regardless!! haha wow, seriously amazing job. Also just for the record, I don’t think your love for more simple designs has put you back at all. In fact I think it’s made you stand out (I don’t know, maybe I’m biased because I’m the same way and love simplicity, and because I’m just rooting for you to win. Shhhh on that last part though 🙂 but seriously you’re definitely doing something right so I wouldn’t worry. Brilliant bag! Completely useable and great customisations! Off to scour the net for the pattern! I absolutely love your fabric choices. I’m rooting for you! Really impressive, your skills are fantastic. I love, love, love this bag! The fabrics are perfect. I love this bag! This is absolutely the sort of thing I need! And, Kelli, I love your clean & classic aesthetic! It’s gorgeous and modern and SO wearable. And if it looks ‘simple’ it is deceptively so – it’s HARD to make something look so put together and understated! This is so, so beautiful! It’s so professionally done! I love it! And I’m a huge fan of your clean, modern aesthetic. Your makes always look expensive and classic. Stunning with wonderful details! Simplicity at its best! Really love this bag. the leather accent is super! Love, love, love it! The leather takes it to a whole new level! So fashionable! Great fabric choices, great hardware and I really like the leather zipper pull. I also love simple, clean, modern fabrics and designs. And this purse is just perfect. That pop of green in the inside is great! wow your bag is so perfect! I would buy it in a second. =) Great job! Your bag is stunning. I love the clean look of your fabric choice and i think the leather accents totally hit this challenge out of the park! I’m thinking I may need to copy it seam for seam! You bought this for $850 at Coach and you’re passing it off as something you sewed, right?? Because it’s fantastic. It’s really pro-looking and high end and I want it. Keep up the great work, Kelli!! Wow, I love this! I completely agree about a simple, clean aesthetic – it’s so much more classic. Gorgeous! Wow, Kelli. This is fantastic. I’m glad you stayed true to your style, it came out perfect. I’m in love. 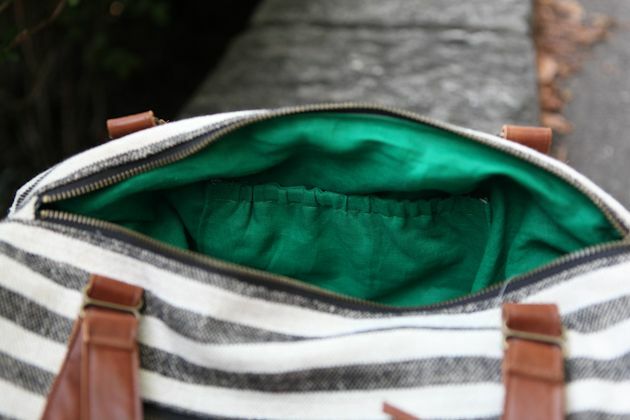 Your bag may be simple, but I just love this striped fabric with the leather and that green lining. You have such a great eye for colors and texture. It looks very professional and expensive! Classic, beautiful & versatile! It looks incredibly well made, nice work! Perfect! 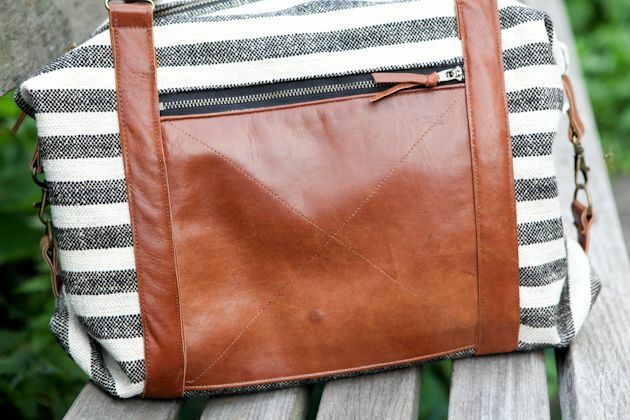 The pairing of the striped fabric with the leather accents is just perfect – I love this! These look like catalog photos, in the best way–and if they were, I would be clicking “Buy Now” right this second. 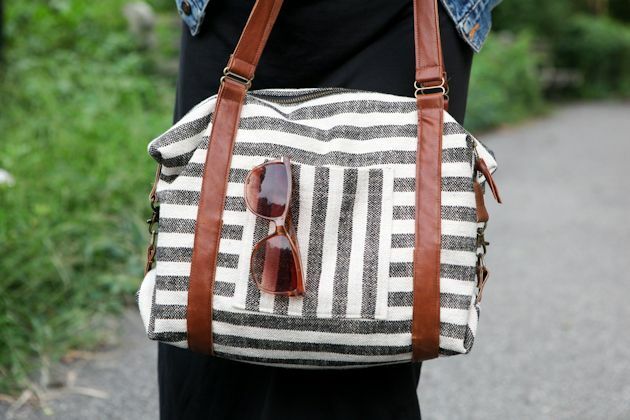 I looooove this bag, and now want to make one just like it! 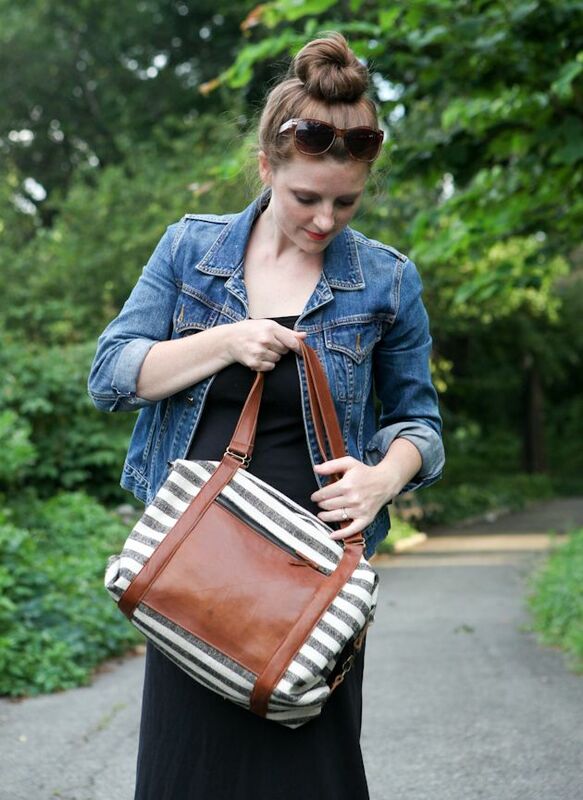 Very impressed by you–all the leather, and that fabulous stripe! Awesome work. This is a beautiful bag! And I love your clean and modern style, too, and it works for you. 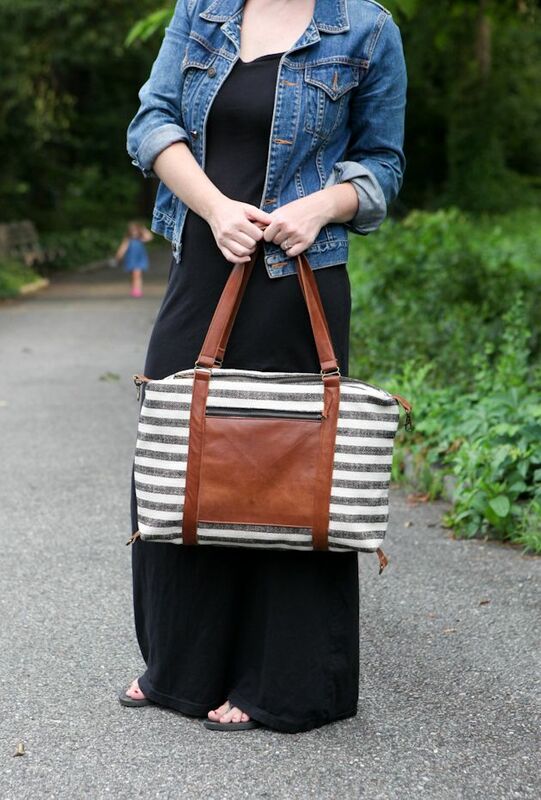 The stripes + leather are stunning. This looks like an expensive RTW bag from Saks or something! This is a gorgeous bag! I love the fabric/leather combination you’ve used. 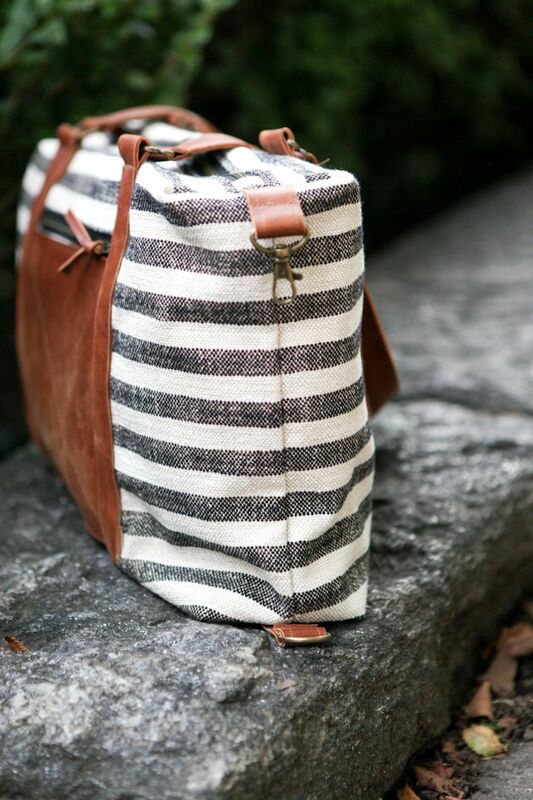 Just found your blog and absolutely love this bag! Look forward to seeing you on my reader list! You have great style! The striped/leather accents are just gorgeous. 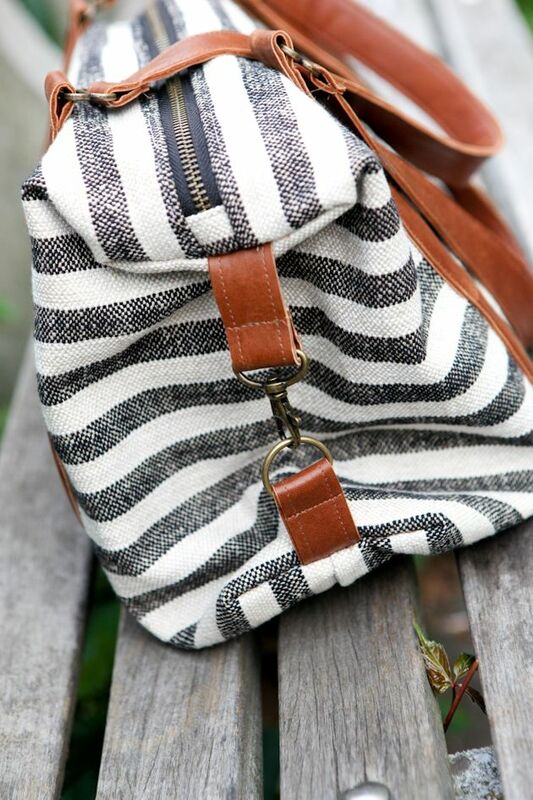 Do you think it would be pretty easy to make this purse larger with the pattern you used? 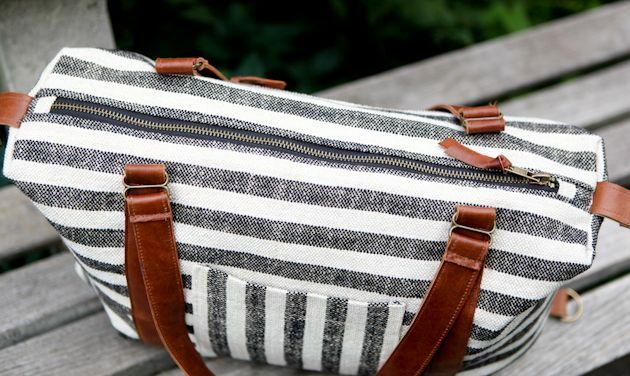 I’m looking to make a travel tote like this but I’m afraid this isn’t quite big enough.